Thoroughly research local moving companies. Broaden your research by reading Top Rated Local® reviews and customer testimonials. Consider how many years a moving company has been in business and their overall experience in moving offices. 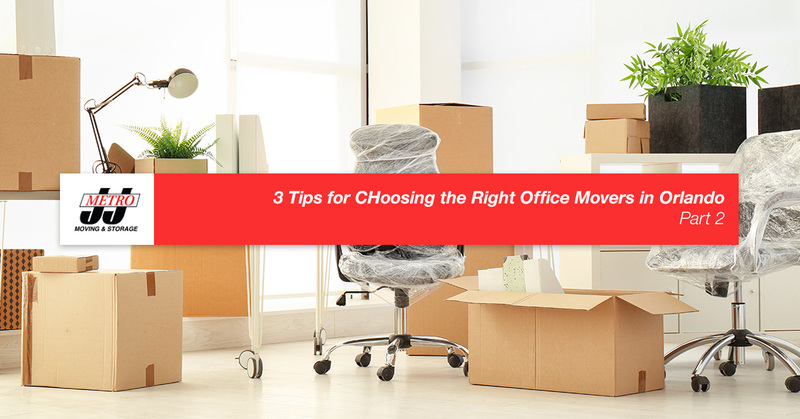 These are some of the ways you can begin your search for the right office movers for you. As a Top Rated Local® moving company with more than 50 years of experience in residential and commercial moves, we know a thing or two about moving an entire office. We want you to feel confident that you have chosen professional movers who will get the job done right. Here are three more considerations for you to keep in mind while choosing professional movers to relocate your business. Then, visit our site to learn more about our commercial moving services, and call us for a fair, accurate moving estimate. Now that you have explored a few moving companies and read their reviews, you can move onto some of the more pressing aspects of choosing the right office movers. It is essential they have all the proper credentials to not only lawfully operate a moving company, but also that they have the certifications and licenses required by state and local governments. Clearly, they will need to a have a business license, but also check that they have the proper licenses to operate their moving trucks and any specialized equipment, for instance. These checks will guide you towards a reputable moving company rather than some Joe Schmoe with a pickup truck claiming to be a professional mover. This will protect your money, time, and belongings. If they didn’t have an immediate answer to a question, were they willing to do some research and get back to you? Did they offer a general explanation of their procedures? Did they explain what the moving quote and costs cover? These are just some of the things to keep in mind during your initial interaction with a moving company and their management staff. What Makes Them Different from the Rest? Finally, moving companies are a dime a dozen here in Orlando. As you’re researching companies and comparing them, look for characteristics that make one company stand out from the rest. For instance, do they offer a fleet of state-of-the-art moving trucks for a safer, more efficient move? Do they offer storage facilities for objects that can’t be moved into your new location right away? Do they offer packing services to make your commercial move even more streamlined? Do they manage all aspects of a commercial move with innovative, comprehensive software to ensure each and every aspect of a move is accomplished in the most efficient way possible? Are they able to uninstall, move, and reinstall everything from office furnishings and medical equipment to an entire computer network? Do they employ fully-vetted and highly trained moving crews who are friendly, professional, and trustworthy? Look for the unique characteristics that make a moving company stand out from the others. We hope you have found this guide to choosing a moving company helpful. At J & J Metro Moving & Storage, we would love to relocate your business, but if we’re not the right movers for you, we want to help you choose one that is. As professional office movers in Orlando proudly celebrating our 50th anniversary as a top moving company in Florida, you can count on us to move your entire office. We are committed to honesty and integrity in everything we do, which shows in our with excellent customer reviews and recognition as a Top Rated Local® commercial and residential moving company. We are dedicated to making your move streamlined so you can keep your business running and growing throughout the entire move. Call us or click for an instant, no-obligation quote and let our friendly and reliable team move your business for you.